Turn Tuesday on its Head! Or turn yesterday’s painting on its head. I added soft chalk pastel to yesterday’s painting and then I went too far with it. Luckily though, I took a picture beforehand. Now I’m thinking I may abandon this one OR I may add texture paste and acrylic OR I may add plain old acrylic. Wherever the wind doth blow and Father Time alloweth! Happy Tuesday and I hope everyone is having a smashing week! I wrecked it by going too far with the pastels. I didn’t post the gone too far image hehe. I took a photo before when I stopped for the night and luckily so because yeah. Killed it. But it is in my little journal so I can’t cut it up. That’s a terrific idea though, thanks Kerfe. Could you cut it out, rearrange it, and paste it onto another page in the journal? I have an art journal like that. I use both sides too, so I do my pasting onto thick watercolor paper on both sides if I do one of those pages. Do you spritz your pastels with matte sealer? I like the added warmth! It’s all in the process, right! You are having fun! Thanks, Sharon! 😀 I will do it! I’m glad you took a photo of it before you change it. I like the color palette a lot and I thought of the windows in Paris when I saw this. I like it! Oh, nice, Deborah! Sounds beautiful. Thank you, I’m so glad this painting inspires a beautiful memory like that. 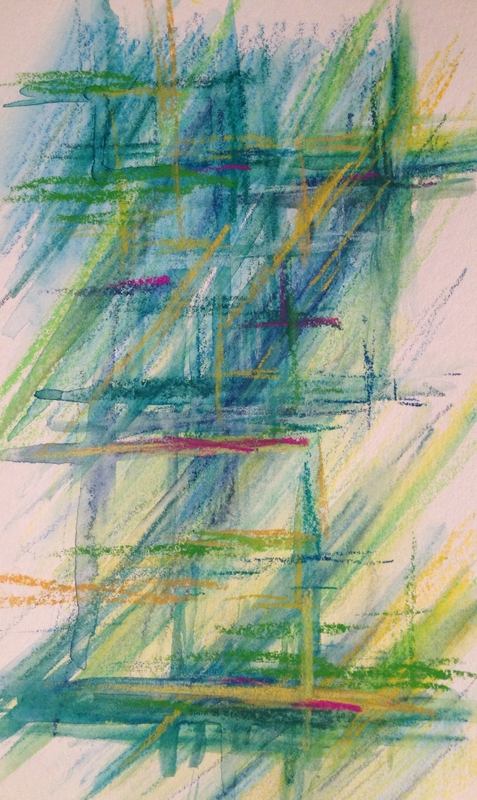 I have a lot to learn about pastels. I am a huge fan of Debora Stewart’s work and I’d really love to do an exclusively pastel (or pastel over acrylic underpainting) abstract piece like she does. She gets so much depth. She is really amazing. I’m so glad you like it. Loving the colors in this. Thanks Jill. Looking forward to seeing your masterpiece! The spirit of adventure! roll the dice! I still think it looks pretty darn good! Thanks Debi! I didn’t post the “gone too far and icky” stage lol. I luckily took a photo when I stopped the night before. Have you ever done acrylic over top pastel, Debi? Should I put a gel down prior? I’d rinse off what I could. personally. And then – lay a thin coat of gesso over top. Use clear medium or gel if you want too. OK, thanks for your feedback. This is in my art journal. I need to get one with perforated pages I can tear out for circumstances like this. Thanks, Debi. Thanks, Donna. I have so much to learn but it’s always fun! Laura, I love the stoke movements and your color palette. It reminds me of slanted rain on a spring day. I think this is your calling, my friend. Aw thanks so much Connie. You’re so very kind! Never abandon a painting. There’s nothing that can’t be fixed in mixed media! Looks a bit like a cityscape to me! Love the colors! Thanks, Teresa! I love that interpretation! That is why I love acrylic – I can keep adding, and occasionally scraping away, until, layer after layer, I like the result. I look forward to seeing what this painting becomes! Thanks! Yeah, that is a real bonus of acrylic work. Reminds me of sheets of rain outside a window. Me too, Suz! 😀 Thanks for stopping by. If you don’t like it add a little gesso and blend the colors. I like this one…it reminds me of the all-day-long, pouring rains you see at this time of the year, and how headlights of cars and streetlights shimmer and shine through the rain. Aw thanks jenny. I’m just dipping my toe in to the world of soft pastels. I have a lot to learn. I seem to do better with abstracts in acrylic. Thx for stopping by!